Drought affecting the western Prairies remains the biggest issue of the 2015 cropping season. Some parts of Alberta and Saskatchewan were hit by thunderstorms overnight Thursday June 11 and Friday June 12. The following map from Environment Canada illustrates that rainfall. Yellow areas indicate rain accumulation of 15 millimetres or more. 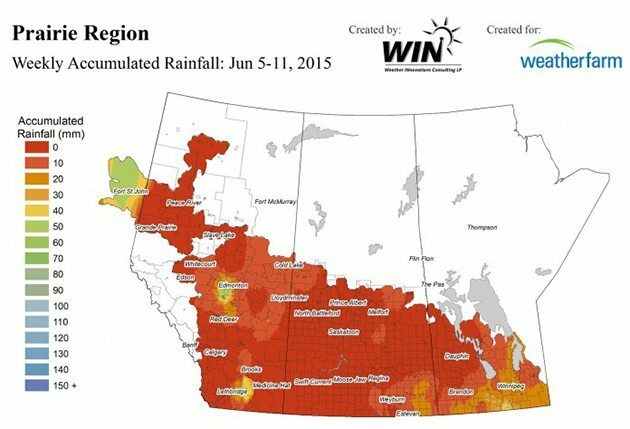 The following map shows the accumulated rainfall in millimetres from June 5 to midnight June 11. The following map shows the percent of normal rainfall for the seven days June 5-11. 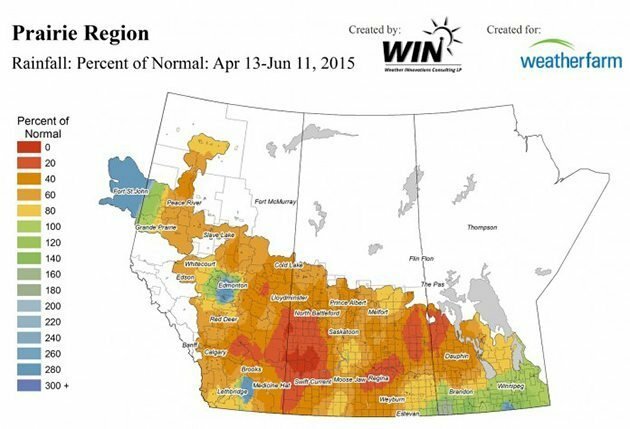 The following map shows the percent of normal rainfall for the 60 days from April 13 to June 11. The following maps from the U.S. Weather Service – Weather Prediction Center show rain forecasts in inches. Green areas range from 0.01 inch to less than 0.5 inch. This first map shows amounts that might fall Saturday, and suggests that close to half an inch could fall in some areas in southern Manitoba. Heavier rain in Oklahoma and Kansas could delay the U.S. winter wheat harvest. The following map is for Sunday. The following map is for Monday. This final map shows the predicted accumulation from Saturday though to the end of Wednesday. Accumulations in the Prairies continue light but a lot of rain in expected in southeastern Kansas and central Oklahoma. Rain in the Midwest will mostly be beneficial to developing corn and soybeans but in some areas it is getting too wet.